An effective, supportive Board and an excellent working relationship between trustees, staff and volunteers are essentials for the successful operation and governance of a charity. 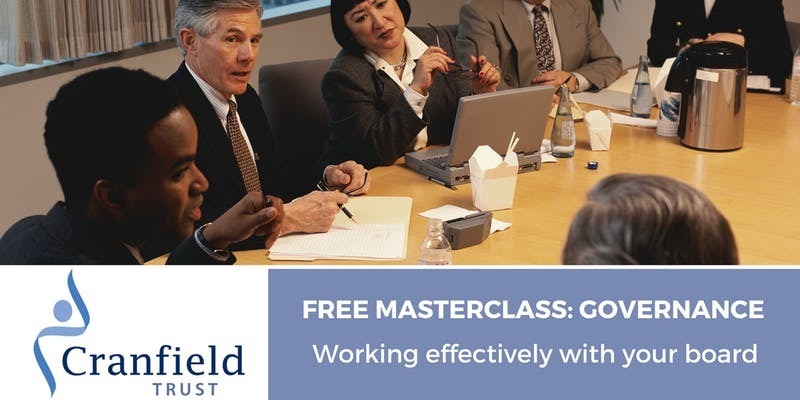 Trustee recruitment and induction, defining roles and responsibilities, keeping up to date with regulation and business pressures, the vital role of the Chair and their relationship with the CEO or equivalent – these are among the key issues that will be explored at a Cranfield Trust Masterclass. Cranfield Trust is delighted to invite you to this interactive and participative event to be held in Edinburgh. Lunch will be provided at the end of the event. This event is exclusively for voluntary sector organisations. Target participants: Spaces are limited to two per organisation. We recommend that your organisation leader (i.e. Manager or CEO) and the Chair, or another member of your organisation’s Board, attend. The “Working Effectively with your Board” Governance Masterclass will examine the principles and practices that will help you work with your Board to best effect, and how to be ready and prepared in anticipation of challenges for the organisation, before they arrive. The workshop will offer both expert input and the chance for peer to peer networking and learning. By attending the workshop, you will have a chance to exchange ideas and develop best practice. The workshop will be led by Ian McKenzie on behalf of the Cranfield Trust. Ian is Lead Partner of Animate, who provide organisational development support to a wide range of Public and Third Sector organisations in Scotland and beyond. Ian has an MSc in Development Management and brings over 30 years experience in the field. He is particularly interested in exploring ways of channelling the positive energy that flows when people put their values into interdependent collective action. His current work focuses on governance and leadership development, and encouraging whole system approaches to organisational change. He is a trustee of With Kids, a charity that provides a range of services aimed at supporting children and helping build resilience and emotional and mental well-being. Cranfield Trust is able to offer this class free to delegates thanks to Ian McKenzie who is giving his time for free, DLA Piper, which is kindly hosting this event, and the support of a number of individuals from Cranfield School of Management's MBA Class of 1989. NB. Whilst we are happy to 'signpost' information sources on the setting up of Boards, legal requirements etc. this workshop will not be aimed at covering these areas in detail.